Generation Hire & Sale Stockport have recently worked in collaboration with their client on the refurbishment of the Grade II listed building Calderstones Park Mansion House in Liverpool which is currently undergoing a transformation into an International Centre for Shared Reading. With the project due to complete in Spring 2019 it was essential to ensure the house remained covered to protect the original features and security of the building, and the Generation UNIRoof system was chosen as the most efficient and effective option to cover the renovation works. 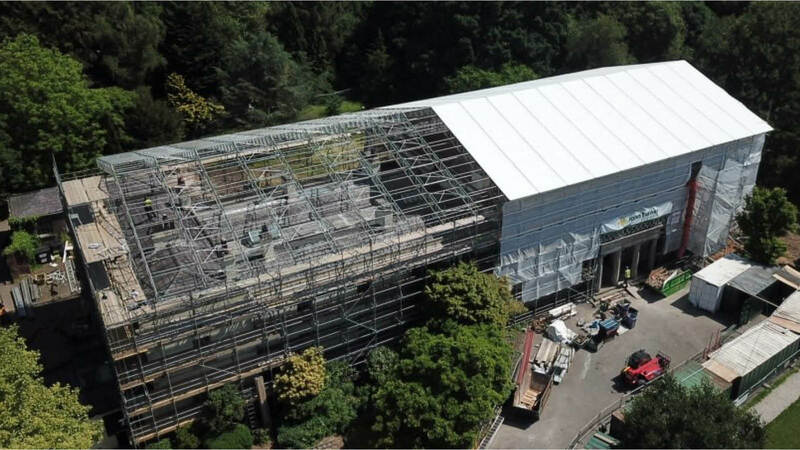 With the high levels of experience within the clients Scaffolding team, the 22 bay UNIRoof structure was erected in a matter of days; by rolling the roof in sections and utilising the Generation Trax Tube Holder and Castor system. This system provides a simple and cost-effective way of moving UNIRoof bays along a supporting structure, eliminating the need for working at height. The project required a span of 21m to ensure coverage of the grade II listed building. The Dessa 780 beam was chosen because of its impressive loading credentials. With a shear capacity of 30.7kn and user-friendly self-weight per metre of 5.66kg, the minimal strut configuration allows multi-fixing points, ideal for awkward applications. This is just one of many collaborations between Generation Hire & Sale and their client who have established themselves as a specialist in undertaking high profile jobs such as this, and Generation Stockport are proud to be associated with them as a core supplier.